Country Lane Veterinary opened April 1, 1990. Dr. McKenna was raised on this homestead where his family had a Holstein dairy farm. 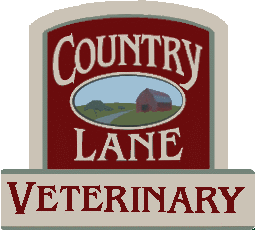 When Dr. McKenna graduated from veterinary college he and his wife Iva came back to the Barre area and had the barn renovated into an animal hospital. As the practice has expanded they have utilized more of the barn. The rest of the barn holds Guernsey cows, and chickens that Dr. & Mrs. McKenna's four daughters own and show at fairs, under the farm name Wee Kin Farm. A lovely ride into the country where you can hear roosters crowing, and see beautiful orange and white cows grazing in the pasture adds to the atmosphere of this family friendly practice. Almost escaping to a bygone era, walking into the red gamble roofed barn, you and your pet are welcomed by name. However the practice protocol and technology within the practice are up to date and state of the art, with bloodwork results performed within minutes, x-rays developed quickly, and an EKG being run on every intubated anesthetized surgery patient to ensure that your pet is given the best treatment. With a doctor that will listen to your concerns and help you to feel comfortable with whatever course of treatment you chose to have performed.